Recently I read a post which expressed a deep longing for a return to past Catholic rituals — one being Gregorian chant. I agreed and realized I had come full circle as long before I came to God, or the Catholic faith, I loved listening to Gregorian Chants. 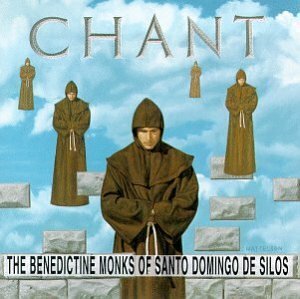 Like many other people in the 90’s I became acquainted with it through the popular “Chant” album by the Benedictine Monks of Santo Domingo de Silos. Their deep resonating voices hauntingly singing spoke to my soul. I listened to it while I meditated and while I created art. The chants inspired and moved me even though I did not understand the language or origins. I often lit a candle while I listened and eventually I started to burn incense. One day a Protestant friend came over, saw the candles, smelled the incense, heard the chanting and went into deep shock, “What in the world are you doing? Turn that off! Blow that out!” She proceeded to ask if I had gotten into some kind of pagan cult. It took me a while to calm her down. I explained that my little ritual had just evolved over time and had nothing to do with witchcraft or paganism— I was simply inspired by the beauty and mystery. Being a blonde, I can be a little slow on the uptake so even though Chant was obviously by monks, at the time, I didn’t realize the “songs” I had been singing along with were prayers. Looking back I now wonder whether the “inspiration” I felt was actually a result of praying them however poor my understanding or sing-along Latin. Amen let every man say. — via Gregorian Chant Benedictinos – YouTube. p.s.s. If you are blonde and took offense at the above “stupid-blonde” innuendo I apologize. I will try to joke about brunettes soon – to be fair. p.s.s.s. If there is a better translation of the Ave Mundi Spes Maria let me know! Thanks! That first question requires a long story… Long story short, Fr LaBoy (then brother) roped me into it back when we first met each other in ’93. I learned it from him. I returned the favor this year when I invited him to write weekly for Biltrix. As for books, I used a compilation of sorts that was published in house (i.e., in the seminary where I taught). I can get you the information on the source material and some manuals that can explain how to read and sing Gregorian Chant, but I don’t have that information at hand right now. The best way to learn would be through first hand experience. You may not be American Idol material — most of my students weren’t either — but chant is very simple and with patience, anyone can learn it, who’s not completely tone-deaf. I would recommend doing some research to see if there is a choir in your area, and ask if you could join, just to learn. If that does not work, try a monastery. If they can’t help you personally, they could probably tell you were you can go to learn it first hand. In my opinion you’ll need more than a book. Chant has to be experienced, because it is a prayer. As they say, he who sings prays twice. I will track down some sources for book material and share the links with you hear. As for the rest, Good luck! Gregorian Chant is uplifting and oh so beautiful! !